Refugees from war-torn Syria claim racism in Germany has become so extreme they want to go home as a growing anti-Muslim movement sees soaring attacks on foreigners. The nation has been gripped by a spate of anti-foreigners rallies, violence and arson attacks against refugee homes or would-be shelters as hundreds of thousands seek refuge in the country. This year has already seen about 200 arson and other attacks against refugee housing while support for anti-Muslim movement, Patriotic Europeans Against the Islamization of the West (PEGIDA), has been growing. The Muslim threat to sack Rome, the very heart of Europe, is more serious than people think. We see now that all of the atrocities Muslims are perpetrating in the name of Islam is designed to inflame the West's common citizens and instigate a massive bloody war. From child grooming to beheadings, its all part of the plan to incite intercontinental (Western) retribution against them in order to fulfill their religious destiny. The problem however is the reticence most Westerners demonstrate when it comes to Islam, which is cloaked and protected by the thin veneer of insane Marxist based political correctness. Once that delusion is cracked, however, White Westerners are entirely capable of crushing this subhuman threat in short order. An ISIS e-book on how to accomplish their caliphate goal of sacking Rome stresses enlisting “the Islamic State’s secret weapon = secret white converts” to take on Italy. The Rome title is one of a series disseminated online that includes Khorasan, Syria, Arabia and Persia, with a forthcoming “Black Flags from Palestine” title promised. Even before the talks among the leaders (the term is here employed in its purely technical sense, as regards Dave (Cameron, PM, Great Britain) and his fellow Europeans) began, the Downing Street bruiser was squaring up for a fight. He denounced as “international machismo” Vladimir Putin’s deployment of a fleet of warships off the Australian coast. Dave’s pique was understandable since that is not an option open to him, due to lack of ships, though does he not have an aircraft carrier without planes? Or is it planes without a carrier? Or do we have one we share with France and get to use when there’s an ‘r’ in the month? Or whatever. Moreover, these groups have every intention of deliberately targeting White people...in 83 cities no doubt. And isn't it "odd" how this Ferguson explosion is timed almost exactly with Obama's amnesty executive order? Best be ready. Everyone knows the government, with its lapdog mainstream media in lockstep, has whipped up the Ferguson situation into a total frenzy. It doesn’t matter what the grand jury decides now. Fear and anger are very powerful weapons and everyone who has allowed the powers that (shouldn’t) be to steer their emotions on this one has taken the bait. The cops have stocked up on nearly $200k worth of riot gear, less-lethal ammunition and the like. Ferguson residents have been advised to go get guns because the cops won’t be able to protect them all from what’s coming. Firearm sales in the area have skyrocketed. Everyone is on edge. Missouri’s governor has now preemptively declared a 30-day state of emergency and called out the National Guard — and the grand jury hasn’t even made it’s decision yet! Ferguson, however, is not the only city set to hold protests immediately following the Darren Wilson grand jury announcement. And what better way to teach than with blonde-haired blue eyed dolls? This summer, in his hometown of Raqqa, 13-year-old Mohammad was forced to attend a children's training camp established by the Islamic State of Iraq and Syria (ISIS). 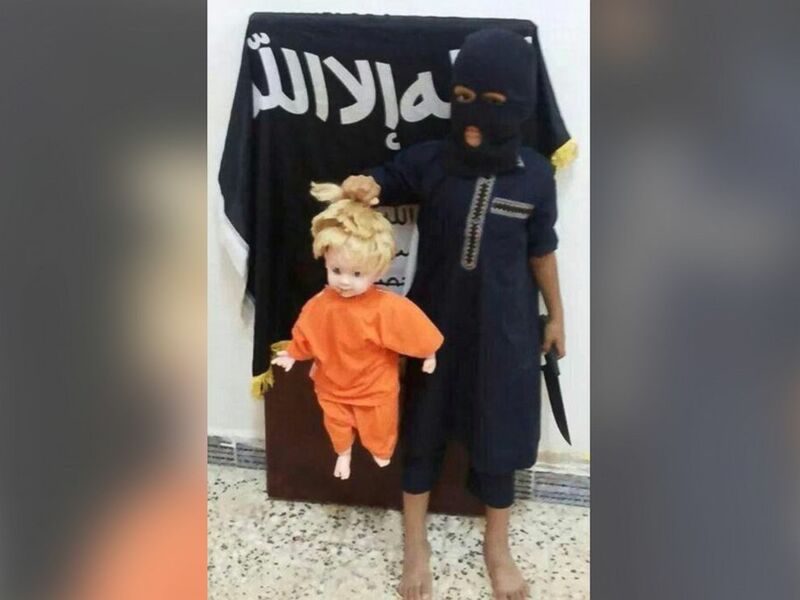 After his return, his mother says she was surprised to find in his bag a blond, blue-eyed doll – along with a large knife given to her son by his ISIS supervisors. When she confronted Mohammad, he told her that the camp manager had distributed the dolls and asked that the children decapitate them using the knife, and that they were asked to cover the dolls' faces when they performed the decapitation. It was his homework: practice beheading a toy likeness of a blond, white Westerner. What “people” differences are relevant? Let’s start with race and ethnicity. From a man who used to take the simple-minded gun-control position “fewer guns = less homicide,” it was surprising evidence of growth. After making his point, however, Moore made a mistake in following up with, “and yet we don't seem to want to ask ourselves this simple question: "Why us? What is it about US?” It’s not, however, that we don’t want to ask the question. It’s that we don’t want to hear the answer. Critics say the project's underlying objective is to convert non-Muslim children to Islam by bringing proselytizing messages into public schools under the guise of promoting multiculturalism and fighting "Islamophobia." The group recently ran an advertisement promising to pay 250 Czech korunas ($13 dollars) to any student aged 15 to 18 years who would attend a two hour presentation about Islam. More recently, Muslims in the Czech Republic have tried to ban a book they say is Islamophobic, and have filed a ten-page criminal complaint against its formerly-Muslim author. The Czech government has approved a new project aimed at promoting Islam in public elementary and secondary schools across the country. The group says the Czech Ministry of Education has authorized it to organize lectures and seminars aimed at "teaching Czech schoolchildren about Islamic beliefs and practices" and at "fighting stereotypes and prejudices about Muslims." But critics—there are many—say the project's underlying objective is to convert non-Muslim children to Islam by bringing proselytizing messages into public schools under the guise of promoting multiculturalism and fighting "Islamophobia." Former US congressman Ron Paul has defended Russian President Vladimir Putin over the upcoming referendum in Ukraine’s autonomous region of Crimea. Following the current crisis in Ukraine, people in Crimea will vote on Sunday on whether they want to be part of Ukraine or Russia. In an interview with Fox News, Paul said Washington and its Western allies participated in the overthrow of the government of Ukrainian president Viktor Yanukovich. “This whole thing that Putin is the big cause of the trouble and yet there’s pretty good evidence that the Europeans as well as the American government had to contrive to have the overthrow of a government that most people say had been elected,” Paul said. “And then for them to come along and say ‘Well, it’s an illegal government,’ and they want to have a referendum now, you know, in Crimea ‘Oh no that’s not permissible’,” he added. Guess what? Oklahoma did it anyway. Oklahoma is the only state that Obama did not win even one county in the last election... While everyone is focusing on Arizona ’s new law, look what Oklahoma has been doing!!!! Oklahoma recently passed a law in the state to incarcerate all illegal immigrants, and ship them back to where they came from unless they want to get a green card and become an American citizen. They all scattered. HB 1804. This was against the advice of the Federal Government, and the ACLU, they said it would be a mistake. You saw it coming, right? For those of us who have been following the unrest in Ukraine, the last couple of days have been quite hectic. Kiev is in turmoil, Lviv has proclaimed its desire for independence, ethnic Russian separatism is rising in Crimea and the Euromaiden demonstrations have so far claimed the lives of more than a hundred people. The country is broken, falling apart and fragmenting into smaller entities, some analysts are calling Ukraine the next Yugoslavia. But what exacly is so special about this country? Why are the Europeans even in Ukraine? And what are Russia's interests in Kiev? A senior US State Department official has allegedly been caught giving an unexpected message to the EU while discussing Ukrainian opposition leaders’ roles in the country’s future government. The phone call was taped and posted on YouTube. "F**k the EU," Assistant Secretary of State for Europe Victoria Nuland allegedly said in a recent phone call with US ambassador to Ukraine Geoffrey Pyatt, as the two were discussing a deal to end the crisis in Ukraine. “The “Model Statute for Tolerance” is a proposal of the “European Council on Tolerance and Reconciliation”, (ECTR), a non-governmental organization established in Paris in 2008 by the former president of Poland, Aleksander Kwasniewski, and the president of the European Jewish Congress, Moshe Kantor. While European leaders are busy expressing public indignation over reports of American espionage operations in the European Union, the European Parliament is quietly considering a proposal that calls for the direct surveillance of any EU citizen suspected of being "intolerant." Critics say the measure -- which seeks to force the national governments of all 28 EU member states to establish "special administrative units" to monitor any individual or group expressing views that the self-appointed guardians of European multiculturalism deem to be "intolerant" -- represents an unparalleled threat to free speech in a Europe where citizens are already regularly punished for expressing the "wrong" opinions, especially about Islam. If you are going to pick a fight with those guys, you better pack a lunch. They fight dirty and they are absolutely relentless. They will never forget and they will never, ever forgive. If Barack Obama is going to attack Syria, he is going to do it without the support of the American people, without the approval of Congress, without the approval of the United Nations, and without the help of the British. Now that the British Parliament has voted against a military strike, the Obama administration is saying that it may take "unilateral action" against Syria. But what good would "a shot across Syria's bow" actually do? A "limited strike" is not going to bring down the Assad regime and it is certainly not going to end the bloody civil war that has been raging inside Syria. Even if the U.S. eventually removed Assad, the al-Qaeda affiliated rebels that would take power would almost certainly be even worse than Assad. Even in the midst of this bloody civil war, the rebels have taken the time and the effort to massacre entire Christian villages. Why is Barack Obama so obsessed with helping such monsters? There is no good outcome in Syria. The Assad regime is absolutely horrible and the rebels are even worse. Why would we want the U.S. military to get involved in such a mess? "From now on, therefore, every suicide bombing in Damascus - every war crime committed by the rebels - will be regarded in the region as Washington’s responsibility. The very Sunni-Wahabi Islamists who killed thousands of Americans on 11th September, 2011 – who are America’s greatest enemies as well as Russia’s – are going to be proxy allies of the Obama administration." It is well past the time for Ireland's Protestant and Catholic warring factions to bury the hatchet and expel the real enemy, not to mention vanquish the real estate developer. This is BAD. City planners in the Irish capital, Dublin, have given the go-ahead for the construction of a sprawling mega-mosque complex that will cater to Ireland's burgeoning Muslim population. The massive €40 million ($50 million) "Islamic Cultural Center" will be built on a six-acre site in Clongriffin, a new and as yet unfinished suburb at the northern edge of Dublin. According to the Dublin City Council, which approved the project on March 7, the Clongriffin Mosque will consist of: (a) a three-story domed mosque and cultural center with towering minarets; (b) a two-story conference center including a reception foyer, conference room, restaurant, banquet hall, kitchens and ancillary accommodation; (c) a three-story 16-classroom primary school and a two-story 12-classroom secondary school; (d) a two-story fitness center with a gym, sauna, steam room and an Olympic-sized indoor swimming pool; (e) a bookshop, library and mortuary; and (f) three four-story blocks of two-bedroom apartments with ground floor shops. Our public discourse ignores the fact that race—particularly in a place like Philadelphia—is also an issue for white people. Though white people never talk about it. Being White in Philly was published in the daily magazine, Philadelphia, and dared to address the discomforts of race relations from honest perspectives of white people. The writer, Robert Huber, related conversations with other whites about black crime and white hypersensitivity. In so doing he exposed the bare-bone reality of living in the midst of black crime. Like Derbyshire before him, Huber was promptly scolded and demonized for daring to set foot off the plantation where the minds of white folks are chained to obligations to fit the cultural Marxist mold. Huber's crime more substantial because he is a credible and respected writer. A black gang called the 44th Street Crew tries to intimidate a pair of white girls and steals a phone. One of them fiercely fights back. “The brainwashing machinery (In Israel--Ed. )is so efficient that trying to undo it is almost like trying to turn an omelet back to an egg." Gideon Levy is the most hated man in Israel – and perhaps the most heroic. This “good Tel Aviv boy” – a sober, serious child of the Jewish state – has been shot at repeatedly by the Israeli Defence Force, been threatened with being “beaten to a pulp” on the country’s streets, and faced demands from government ministers that he be tightly monitored as “a security risk.” This is because he has done something very simple, and something that almost no other Israeli has done. Nearly every week for three decades, he has travelled to the Occupied Territories and described what he sees, plainly and without propaganda. “My modest mission,” he says, “is to prevent a situation in which many Israelis will be able to say, ‘We didn’t know.’” And for that, many people want him silenced. Since the election of Marine Le Pen to the head of the Front National the party has moved from one tactical victory to another. As the baton passed from the previous generation the coalition of “tendances” that forms the party has also changed. This is key to their current and future success, as well as a lesson to all White Nationalists who seek reform through political institutions. The base of Jean-Marie Le Pen’s support was the non-Jewish deportees of Algeria and the veterans who fought to keep the colony. They felt betrayed by De Gaulle who had “heard their concerns and understood them” before pulling out. (Jean-Marie Le Pen left his seat in the Assemblée National to serve with distinction in the elite paratrooper corps, where he lost an eye.) Another base of support is among the Traditional Catholics whose politics are often anti-Republican and anti-Enlightenment. The most controversial were the Vichyists, who were often rabidly anti-communist and did not trust a government whose right wing treated them more harshly than the communist trade union was ever treated. The least ideological of the supporters were the mom-and-pop business owners who were attracted to the “Poujadiste” economic model which favored them. The decision faced by the party when Jean-Marie Le Pen stepped down was between Bruno Gollnisch and Marine. Gollnisch’s supporters had a table set up outside the portico of St. Nicolas de Chardonnet, Paris HQ for the schismatic Traditionalists of the Society of Saint Pius X. Marine was a divorcée who was “very pious as a child” but who no longer practiced. Gollnisch promised to hold firm on the social issues that the religious right lost long ago. He also had the distinction of being sued for Holocaust denial. At the May 1st rally that preceded the vote, the old men who annually march with their Algerian service medals on their chests and their wives on their arms were clearly not the future of the party. Only Gollnisch made an appearance among the party faithful in front of the Opera Garnier before the march to the statue of Jean d’Arc began. He was treated like a rock star by the young, well-dressed Catholics, clearly the activist base of the party.